These reviews are sorted by album. To get to a review, click . Reviews with have been acquired in the past two weeks. If you have or know of other published reviews, please tell us. You can get a credit and and link if we use them. For copyright info, see The Rules. If you want to buy any of these albums...ha! good luck! No, we're kidding - sort of. Check first through Yahoo Shopping. 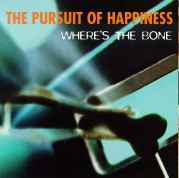 For a more complete discography of albums and singles by The Pursuit of Happiness, check out the TPOH listing of The Canadian Pop Encyclopedia on Canoe.